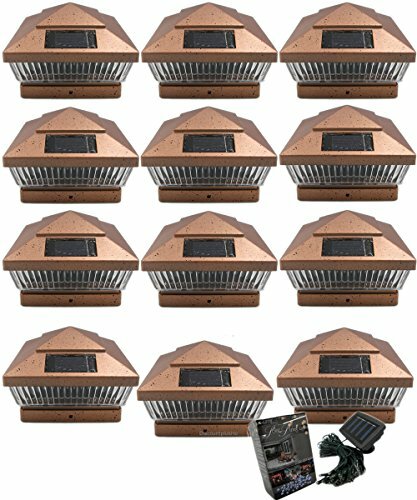 This special bundle deal is for 12X 6X6 solar powered Post Fence Cap lights as shown in the picture for 6x6 wood post with actual dimensions 5 1/2", . Enhance the look of your yard - fence - balcony etc. and give an attractive look by adding these solar post cap lights. They are easy to install, no wires needed. Energy, electrical saving Ideal for areas where conventional electrical supply is not available or hard to run. Base Mounting Dimension: 5 7/8" X 5 7/8"
This Variation listing is For 6x6 Wood Post - in the dropdown option select the correct selection for the type of post you have to make sure you receive the lights with the correct mounting base. INFORMATIVE TIP: 6X6 WOOD POST ACTUAL DIMENSIONS ARE 5 1/2" X 5 1/2". OUR LIGHTS COMES WITH THE CORRECT MOUNTING BASE FOR 6X6 WOOD FENCE POST WITH 5 1/2" ACTUAL DIMENSIONS. Our Lights Are Designed to FIT 6x6 Wood Post With Actual Dimensions 5 1/2" X 5 1/2" Any Question Feel Free To Contact Us Before Placing The order ! If you have any questions about this product by Solar Garden Lights, contact us by completing and submitting the form below. If you are looking for a specif part number, please include it with your message.